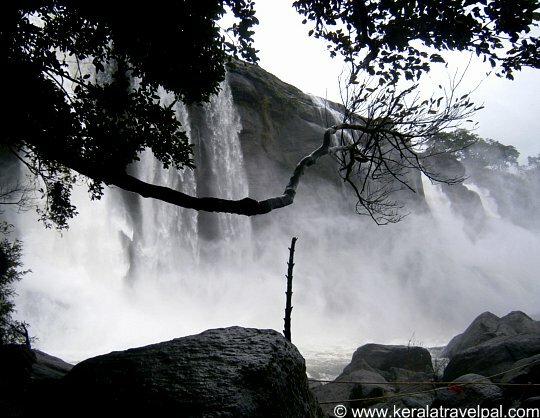 Athirapally falls is widely regarded as the most spectacular of all Kerala waterfalls. It is certainly one of the finest waterfalls in the whole of Indian subcontinent. Athirappally-Vazhachal though mentioned together usually, are two separate waterfalls. In between the two, there is 5 kilometres of scenic area. En route to Vazhachal there is a small roadside cascade, called Charpa waterfall. During peak monsoon, Charpa waterfall even reaches the road. Athirapally falls (also Athirapalli, Athirappally) is located about 33 kilometres east of Chalakkudi in Thrissur District. 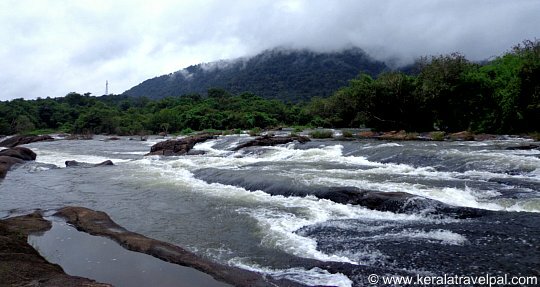 The journey to Athirapally falls takes one to the footsteps of Sholayar mountain ranges which hold bio diverse evergreen forest. Mountain stream originating here flows down to the west. After gathering more water it flows with great fury along the slopes and valleys before thundering down at Athirappally. Waterfall thus created looks spectacular in the scenic background of green hills and huge rocks. Falling magnificently from 80 feet, silvery water splashes down forming a thunderous uproar which can be heard at a distance. 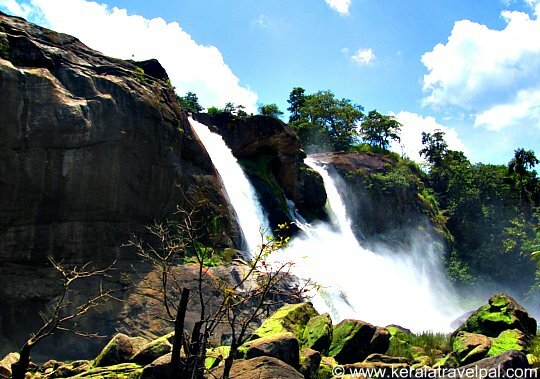 During non-monsoon period, Athirapally waterfall appears in three separate strands. Monsoon rains brings in plenty of water to unite them to a broad mighty downpour. Before reaching the top of Athiraplly falls the stream widens in a flatter area of rocky bed and protrusions. Resultant grandeur has invited several movie makers from all over India to here. Since 80’s this has been a hit location for Movies. Tamil populace even call it Punna Kai Mannan falls. Director Mani Ratnam likes this place so much that he shot several movies including old hit Punna Kai Mannan here. Athirappilly surroundings appear in song scenes, TV ads, and tourism publications. At Athirappally one can trek down to bottom of the waterfall to get a closer view. As usual, the climb down is much easier than the trek up. Expect to get a bit wet as water tumbling down in huge quantities brings to life countless droplets flying all over. Down from the waterfall, the stream continues as Chalakkudi River which ultimately drains into Arabian Sea. This river is a bio diversity hotspot. Out of 85 species of fresh water fish living in it, 35 are endemic to Western Ghats and 9 are endangered. Enjoying Athirapally falls and the attractions nearby require a few days. Locals, mostly though, confine it to a day’s hectic visit. Are you contemplating on few days of relaxed joy in the Sholayar basin? Then staying near the waterfall is the best choice. As there are only a few accommodation options nearby, booking well in advance makes perfect sense. 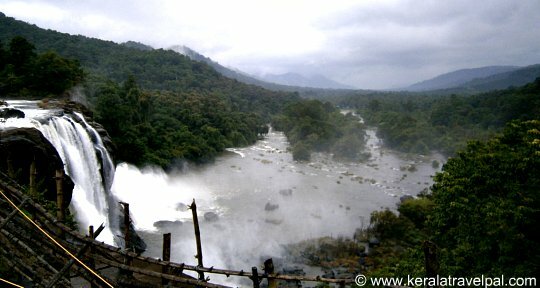 Athirappally falls never dry out and can be visited anytime during the year. Though the waterfall appears in its full glory during monsoons, heavy rains can cause great inconvenience. So, the best time to visit here is immediately after monsoons. The road that takes us here is a connecting path between Kerala and its neighbour. This highway, named SH-21, takes one through Sholayar forest to Valppara in Tamil Nadu. This road to Valppara is through dense evergreen forest rich in wild life. This forest, one of the most bio diverse in Kerala, is declared as an important bird area by the International Bird Association. It is home to elephant, sambar, leopard, sloth bear, deer, and porcupine and much more. Encountering wild animals such as elephants on this forest road is very common. Therefore SH-21 ride involves an element of danger. For this reason, night driving through SH-21 is not just discouraged, it is prohibited. Daytime trip through this jungle path is a great experience. Food Options : Not much of food options other than a few stalls near the waterfall. Several restaurants in Chalakkudi town. Accommodation Options : A few accommodations nearby. Book before arriving here. Best time to visit : From September, immediately after monssons. Can be visited anytime during the year. Nearby Attractions : Vazhachal waterfall, Malakapara tea Gardens, Thumpurmuzhi Gardens Dream World theme park, Silver Storm Theme Park at Vettilapara, Vachumaram, Anakkayam, Peringalkuthu Dam and Sholayar Dam.